NCT Warwickshire Central has recently begun a new Bumps, Babies and Toddlers Group on every Wednesday, at United Reformed Church, Kenilworth from 10:00 – 11:30. We are a friendly and supportive peer group for expectant and parents of babies and toddlers (up to 5 years old). It costs £2 (per family) which includes unlimited tea and coffee (regular, decaf and herbal teas). We sometimes have toast, cake and fruit. We always have biscuits. We also now have snack time for children at about 10:45. We have a dedicated baby area with blankets, mats and toys. We also have a selection of interactive toys for the more mobile little ones and toddlers. Wednesdays (term time) 9.30-11.30 at Warwick Gates Community Centre. 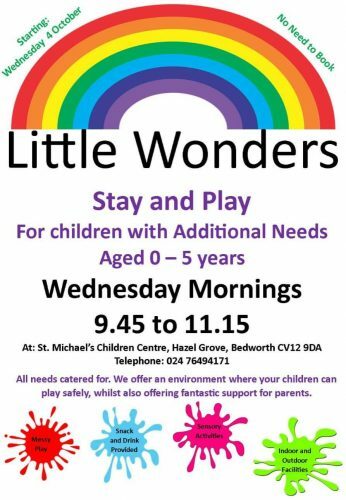 Lots of space, lots of different zones – role play areas, slide & rockers, playdough, train set, craft, sensory play, dressing up, jigsaws, books, baby area… Refreshments provided, and we do singing at the end of the session. We always welcome new people. £2 for one child or £3 for a family/childminder with more than one. Our unique “Bumps to Babes” Coffee group offers an invaluable opportunity for pregnant women and mums with young babies to come along and meet each other. The early months can be an isolating time, so we give you the chance to chat to other mums with newborns to gain support and advice. We aim to facilitate a group discussion each week, addressing common concerns and issues of new parenting, which our mums find incredibly beneficial. Many life long friendships are made through attending our weekly drop-ins, and you will also be invited to join our closed Facebook group for 24/7 support. Noah’s Ark meets each week in term time. Parents/carers and pre-school children are welcome to come along. Our aim is to provide a warm and welcoming environment for all. Activities include craft and painting, play-dough, song-and-story time as well as lots of toys. Refreshments are served during the sessions. Cost per session is £1.50 per family. We ask that you attend 1 session only per week. For more details please contact Katie. Coffee mornings are open to ALL expectant and new parents. Stay and play, snacks provided – Free. A really friendly setting for parents to meet other parents, and children to play – with toys from young babies up to preschoolers. Toys, crafts, snack and singing. For more info contact Chrissie: 07941 843711 , or just come along! A lovely friendly toddler group in cubbington. Visit us at the methodist church hall on Queen street every wednesday during term time 9.30-11.15. Refreshments provided for adults and children plus lots of fun and play.